In the Rodgersia Queen’s garden this Salvia “Violette de Loire” gently smoulders in a sunny corner. Not only is she sophisticated, but earthy and sensual, quite at home reclining on a chaise longue in an 18th century French boudoir. The violet and deep purple flowers are as sumptuous as the velvet suit your dad wore in the 1970’s. Actually, my dad was more of a checked shirt kinda guy but you get my meaning. Pollen dustings show bees have been active, scattering their excess harvest as they head home with their spoils. oooh I like very much……. Me likey too. And there so easy to propagate! 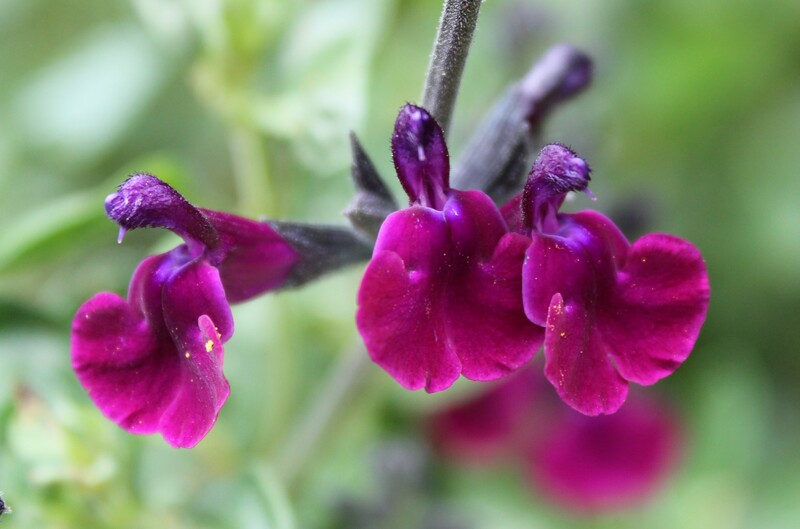 I have a lovely blue salvia I’ll swap a bit for! Very lush and posh looking!